Hebe ‘Anomala’ is an erect, evergreen shrub, growing to 3 ft (1 m) high, with slender upright branches. The branchlets are reddish-purple; the lance-shaped leaves are dark shiny green, 0.5 in (12 mm) or more long. The flowers are white, in terminal spikes, early summer. Hardy in the UK. 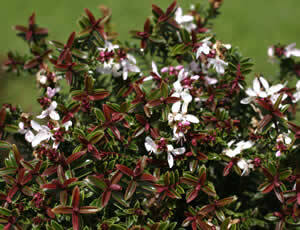 The flowers usually have 3 petals – hebes normally have 4 petals. Another hebe had been grown under this name, upright, with green branchlets and green leaves, flowers in lateral spikes. This has been renamed Hebe ‘Imposter’.